Product prices and availability are accurate as of 2019-04-06 11:03:20 EDT and are subject to change. Any price and availability information displayed on http://www.amazon.com/ at the time of purchase will apply to the purchase of this product. Enjoy mobility and portability with a great full-featured DVD player and 9" TV. The included DC car cord gives the option of viewing on the go and front AV inputs provide easy access for hooking up video games or a camcorder. Features: AC/DC capability; icon TV menu for intuitive control of video and audio functions; 4 picture preference modes for access to preset video settings; DVD-Video/CD/Video CD playback; tray lock feature; front panel headphone jack; side-firing speaker system; MTS stereo tuner; coaxial digital audio output; JPEG viewer; digital picture zoom; sleep timer; and a glow system remote control. Looking for a compact, all-in-one television and DVD player? 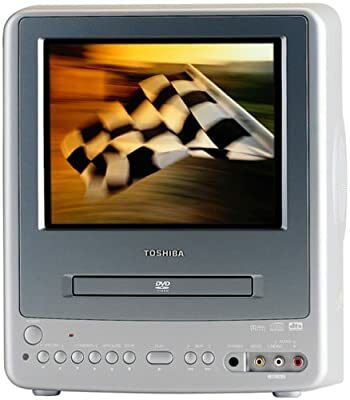 The MD9DP1 from Toshiba combines a 9-inch portable TV with a fully loaded DVD player. This combo unit features built-in stereo speakers with surround-sound output, a wide variety of playback formats, and much more. The DVD player in the MD9DP1 provides a clear, crisp picture with enhanced digital processing. You can take full advantage of that picture clarity with the versatile digital picture zoom option, which lets you magnify a portion of the picture onscreen while in freeze-frame mode or even while watching a DVD in real time. The feature is great for spotting details in movies or even adjusting letterboxed movies to fill your screen. The MD9DP1 plays DVDs, DVD-Rs, and CDs, so you can enjoy all your favorite videos and music. You can also play MP3s and view digital JPEG photos from CDs created in your computer with the MD9DP1. Keep those discs safely in the player with the tray lock option. When this option is turned on, discs can't be ejected without the proper pass code, ensuring that kids can't get into the player and that your discs stay where you want them to stay. Make the most of your music and movies with clear, clean sound. The MD9DP1 sounds great right out of the box, with a built-in MTS stereo tuner and stereo speakers on the side of the unit. When you want an even fuller sound, you can easily hook up the MD9DP1 to a home theater receiver with an RCA-type connection to get a virtual surround-sound experience. The MD9DP1 features Dolby Digital and DTS surround-sound output. A headphone jack is also included to make the most of the MD9DP1's portability. The TV is easy to set up and easy to use with a simple, icon-driven menu and one-touch picture preference modes. There are three preset modes that optimize the picture for sporting events, movies, and regular TV viewing. You can also create your own custom preset that remembers your preferred settings for brightness, contrast, color, and tint. The MD9DP1 also includes a sleep timer to let you fall asleep while watching TV. At less than 18 pounds, this TV/DVD combo can go anywhere. A DC power cord is included so you can even run the MD9DP1 in the car. The front-panel A/V inputs make it easy for you to hook up a video game, camcorder, or other component.